$440.00 ODVF (Society of Friends of the Air Fleet), Moscow Chapter, membership badge, 1923-1925. In very fine condition. $375.00 Badge of the Central Committee of ODVF (Society of Friends of the Air Fleet), 1923-1925. In fine to very fine condition. $975.00 Badge of the ODVF (Society of Friends of the Air Fleet), Northwestern Chapter, 1923-25. Scarce version in hallmarked silver featuring a detailed depiction of a biplane and a vertically oriented blue scroll with the name of the organization. The artwork is in early Constructivist style. This extremely hard to find, essentially flawless example includes original hallmarked screw plate. $590.00 OAVUK (Society of Aviation and Aeronautics of Ukraine and Crimea), membership badge, 1923-1924. More scarce Type 1 having riveted construction with the superimposed emblem of globe, biplane and hammer & sickle. Unlike the ODVF chapters in various regions of RSFSR and other Soviet republics, the Ukrainian society operated under its own name and apparently enjoyed a certain degree of autonomy until the 1924 merger into the all- union ODVF. $475.00 OAVUK (Society of Aviation and Aeronautics of Ukraine and Crimea), membership badge, Type 2, 1923-1924. In outstanding, excellent condition. This organization existed for only a year until its merger into ODVF in 1924. $120.00 ODVF Badge "Ultimatum", 1923. 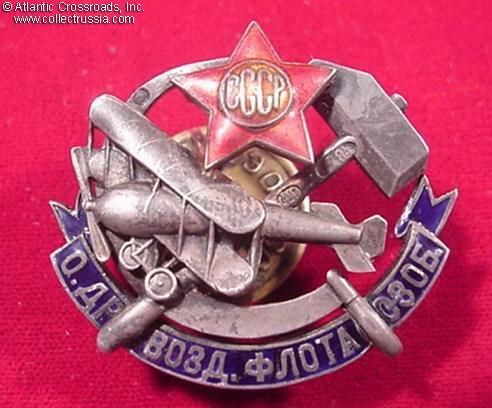 Featuring an airplane and a fist with star, this pin was given for donations to build Soviet air force. The donation drive was as a part of the propaganda campaign in response to the British 1923 note to the Soviet government (so-called "Curzon Ultimatum"). In excellent condition. $695.00 Badge for Flying Safely 500,000 km, #977, with a document, awarded in 1950 to a woman. The booklet, a hard covered booklet, contains a photo of the recipient and shows serial number of the badge. An exceptionally rare and interesting set to a female pilot! Both the badge and document are in excellent condition. $50.00 Award Badge to a Civil Aviation Navigator for Flying 28000 Hours Without Accidents, #129746, 1980s. Attractive mint marked piece in excellent condition. $35.00 Air Traffic Controller Badge for 10 Years of Work Without Accidents, 1980s. An attractive piece in excellent condition. $59.00 Aeroflot Pilot, 3rd class, circa 1960s. $12.00 Civil Airlines Traffic Controller, 1st class, circa 1970s-80s. $10.00 Civil Airlines Traffic Controller, 2nd cl. $8.00 Civil Airlines Traffic Controller, 3rd cl. $9.00 Civil Airlines Radio Operator, 2nd cl. $8.00 Aeroflot Flight Attendant's Badge, circa 1970s-80s. Shows a Soviet maker mark on the reverse. In excellent condition. $90.00 Moscow Institute of Aviation (MAI) graduate badge, with original case of issue, circa 1970s. A very attractive badge in excellent condition. The box is likewise nicely preserved. $160.00 Kiev Institute of Civil Aviation Engineers (KI GVF), graduate badge, circa 1960s. Excellent condition. $125.00 Kirovograd School of Civil Aviation Navigators (KLShU), graduate badge, 1970s-80s. Excellent condition. $130.00 Riga Order of the Red Banner Institute of Civil Aviation Engineers (RKIIGA), graduate badge, Type 3, circa 1980s. $20.00 Badge of an Activist of the Trade Union of Civil Aviation, Komi Autonomous Republic, circa 1980s.